'McQueen is fast because of all those carbohydrates he eats when he finishes his pasta. Chick Hicks? He likes to eat salad and courgettes and peas (and all things green). Sally loves fish, Mack adores his mashed potatoes. Luigi LOVES his sweetcorn.' The list could go on forever and is adaptable for any food crisis. And oh yes, it works. And these will certainly not be the last lies I tell my child in order for him to eat his food. Thank you Pixar! 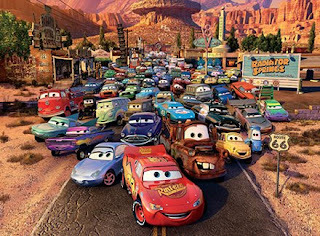 And thank you Lightning McQueen for being my child's role model and hero, for which these lies would not be affective. What about you? What lies were you told as a child? What lies do you tell your children? When I was sixteen, I discovered that my mother had been lying to me and telling me that mars bars tasted of coffee so that she wouldn't have to share her mars bar with me. AHAHAHAHAHA! 16, oh dear. I love it! This is horrible, but we usually warn the Pirate that the Bug will be bigger than him REALLY SOON, if he doesn't eat. Also, lots of talk of what pirates (duh) eat. Oh I don't know about Pirate and Bug, but for our family - Joshua really WILL be bigger than Elliot one of these days. He's about five pounds lighter (and 2 and a bit years younger) than Elliot. I'm assuming that will change now that Joshua is crawling, but it doesn't appear to have made a large impact as yet! I guess I was really non-chalant about the kids' picky stages... When they would say something is yucky or whatever, I would tell them, "Well, then, I guess you'll starve. This is what we're eating for dinner." And when they were older, if they didn't like what was served, they could get up and make their own peanut butter and jelly sandwich (no help from mom). And clean up after themselves. Cardinal rule at our house: "You get what you get, and you don't throw a fit." In other words, if you are picky about what is served to you, make your own dinner/lunch/etc. Or get nothing. I guess I'm a mean mom, but I certainly don't have any picky eaters in my home! I was told meat was actually made out of vegetables once I learned that "meat" meant "animals" and then I didn't want to eat them. I've told my son sometimes that something is sleeping, so that's why we can't play with it. Damselfly - I've used that one! A LOT! haha my son loves the cars movie too although he is a little young to understand it all he grasps the gist of it!